I have a '59 Thunderbird in which I have installed blue dots. 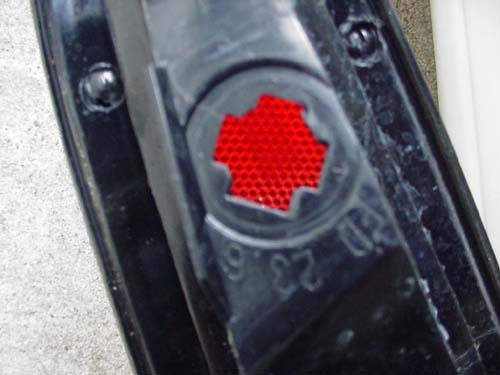 Blue dots are blue pieces of glass a half inch in diameter in the shape of a diamond with the tip cut off surrounded by a metal ring that can be mounted in the red part of the taillight. They were initially promoted as a safety device in the 1920's. For the same intensity of light blue can be seen farther than red, because our eyes are more sensitive to blue. They were subsequently made illegal, when states decided blue light should only be used on emergency vehicles. Customizers continued to use these until the 1960's on their cars, because blue dots produce purple glow and streaks of blue light at night that looks so cool . Now people put all kinds of colored bulbs in their signal and taillight assemblies. I wanted to customize my new Mark VIII in this fashion, but do it in more high tech approach. The way I have the car setup, I can turn on strobe lights in my grill and rear turn signals at flick of a dash switch. Additionally I can change the color of the back up light by the switches I have installed on the dash, because there are now two additional bulb assemblies in the back up light assembly. I can have the taillights continuously red all across at night, or I can have a blue dot type of effect using the blue bulb. 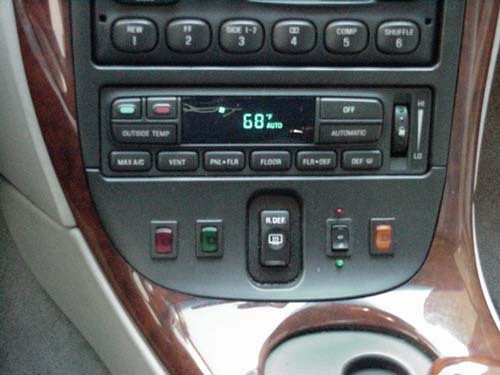 If you have the optional heated seats, the controls are here where I put the switches, so you need to find an alternate place to put the switches. I used mini rocker switches available from NAPA auto stores. The LED's are 12 volt LED's that I picked up at a car show. These rocker switches were difficult to mount neatly and aesthetically, because the panel is asymmetrical and curved. I needed to cut through the panel to mount the switches. To do this right the first time, I cut out silhouettes using Post-it note paper in the shape of the rectangular holes I needed to drill out. I arranged these on the back of the panel, carefully measuring the spacing with a ruler, until I thought they looked right. Next, I lightly sprayed the back with white paint. I removed the Post-it notes. What I had left was an exact template of where the holes needed to be drilled. I used an ordinary drill to make the initial holes, then finished making the contours of the rectangular holes using jeweler's files. 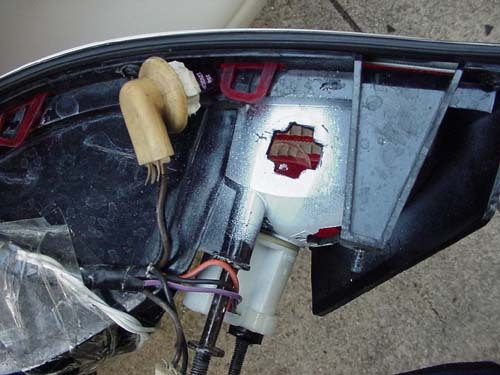 As you can see, there are two additional marker light sockets in the back up light assembly. One was used for a blue colored marker bulb, the other for a red colored marker bulb. 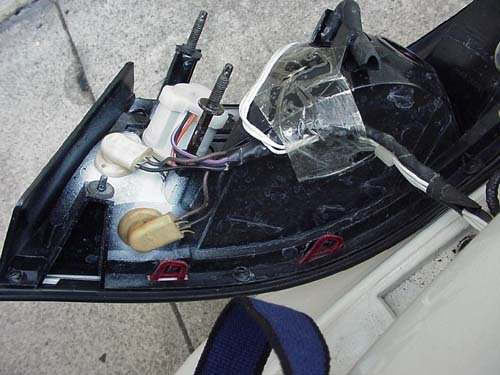 Additionally, the single filament back up light socket has been replaced by a dual filament turn signal type socket. This gave me an extra filament that can be dash controlled for a white light, while leaving the back up light function unaffected. I use the additional white light as a warning when idiots tailgate me. I cut these silhouettes out of Post-it note paper, so I could again precisely determine where to make the holes, before doing any drilling. I used the same white paint method that I previously described. I wanted to get this right the first time, because these taillight cost $150 a piece from the dealer in 1998. Remember when placing these holes, that the socket rotates 45 degrees clockwise after insertion in the hole before locking in. The left and right taillight assemblies will be mirror images of where the holes are placed, but not how they are oriented rotationally. Hold the socket on the taillight in the orientation that you want it to be mounted, then rotate it counterclockwise 45 degrees. This is the orientation of the hole that you want to cut out. You can see the residual of the white paint I used to make the outline of the holes using my Post-it note system. 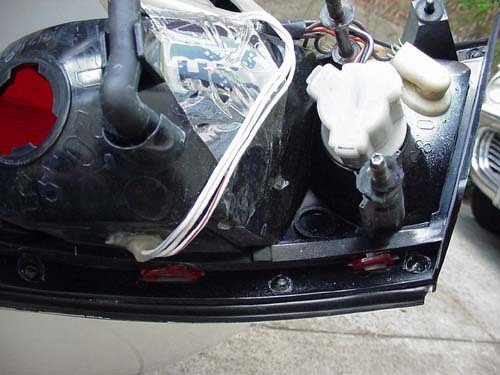 Mounting the sockets in these positions will give you no interference problems; the bulbs do not touch, and the sockets clear the the opening for the taillight assembly. Make sure the holes you make are precise, so will have a waterproof seal. You don't want water in your expensive taillights. Make sure you get the flat type 90 degree type of marker socket pictured here. 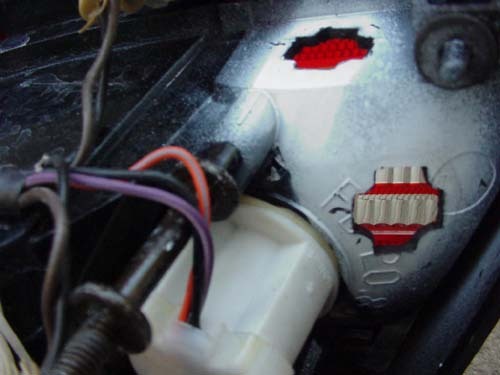 The straight type of socket will give you interference problems when reinstalling the taillight assembly. I used a generous amount of silicone glue to make the assembly waterproof after putting in the strobe light. Running the wires for this type of setup is straightforward. I used the cigarette lighter positive as my positive lead for all the lights, since it is conveniently located in the console. I routed a 10 Ampere fuse in line with the lights to protect the circuit. I used 14 and 16 gauge wire to the taillight and switches. You will need to remove the back seat and the console to route the wires. This lightshow setup is lots of fun, but remember blue lights and strobe lights are for off road use only. You can be sited for these by the police if you use them on the street. I, the club, and this site take no responsibility in how you use these lights or any damages that may result in their use or installation.